love that chair and tent! so cute! 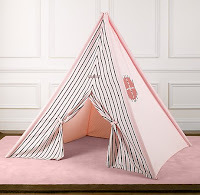 I saw the tent at the RH outlet store near us and almost bought it (but I didn't think my husband would appreciate a pink tent for our little boy!) Love the RH kids line... so cute! The tent and cupcake print are so cute! I love pink and brown together. I love Pink and Brown together! That little elephant is darling! this stuff is too cute! love the pink & brown combo! great combo- pink & brown. 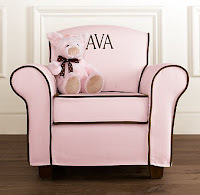 love love love the monogram chair! that chair is absolutely adorable!!! 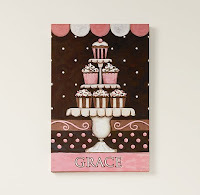 I love the monogram chair and those sweet cupcake prints! 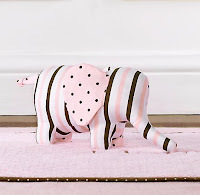 All of those would look so cute in my new little girls pink and brown nursery! I love that chair!! So cute! I want to be little again so I can play in the tent with the cute elephant. 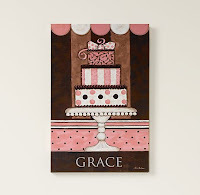 I love pink and chocolate brown together! I would have loved to have that tent as a child!! !